Highlight your diamond solitaire engagement ring with this art deco design ring enhancer. Fashioned in 18 karat white gold, this ring guard features four dainty rows of 76 round brilliant cut certified diamonds. Polished to a brilliant shine this diamond ring wrap is a glamorous way to upgrade your current diamond ring. The gap between the shank guards is 2.64 mm. The top head of the ring accommodates a solitaire stone that has a maximum width of 4.86 mm. 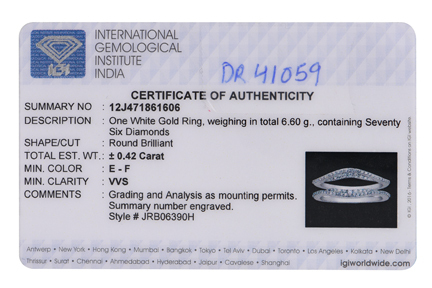 IGI certificate is available with the purchase. Lifetime guarantee included. The solitaire ring is sold separately.